1/4 inch and the issues with achieving it are NOT your fault. Any Janome owner such as myself knows one must adjust the needle position to 41 in order to have a proper 1/4 inch seam when using the 1/4 inch foot. Is this printed anywhere? I do not think so? Wouldn’t it be easier to make the 1/4 inch foot work perfectly in the default needle position? One would think so. So I think it is a conspiracy by machine makers to get us to think they are better than us. It’s not working because we are on to them. Congratulations for figuring out how to get the proper seam allowance without spending almost $100.00 Sew happy! Thanks Terje. So happy to hear I’m not the only one. Munaiba, I am so happy to hear that another woman (Yay us!) helped you figure out how to get that 1/4″ seam! And Terje, I am so happy to hear that this is a Janome thing! 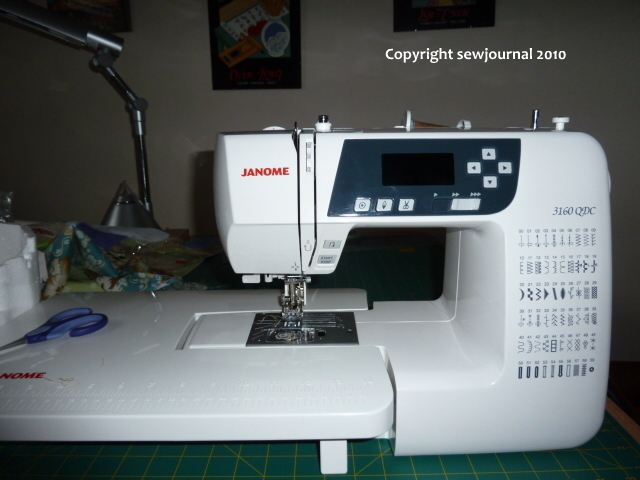 I have a Janome that I bought like new second hand. It is a lovely machine, but it’s nice to know that it doesn’t default to the 1/4″ needle position. I haven’t yet used it for any piecing that was crucial, so I didn’t know that little fact. I will have to check out my documentaion to see if it tells me how to put it in position 41. I have a feeling that “Janome” must mean “neener neener neener” in Swedish!! I applaud you for figuring out the machine was at fault. Sadly I think my machine has beaten me down to such a state that I’ve decided that next machine I buy is going to come with its own operator. One of my favorite writers, Anne Lamonte, states: “Perfectionism is the voice of the opressor the enemy of the people. It will keep you cramped and insane your whole life.” Be kind to yourselves ladies, I don’t think any of us knows what 1/4″ really is anyway, and if you use the same guide and the same needle position throughout, it seems to me that your pieces will all fit together. I would use a piece of masking tape as a guide before I would spend ~$100 on feet (or shoes for that matter), that’s a lot of fabric. Nameste. As regular readers of the blog know I long ago gave up the search for perfection on this earthly plane. However when piecing a rail fence block the piecing needs be accurate or the cross-wise blocks will not be the same size and the block will not come out to 12.5″ unfinished size. hence my problems. I’m glad it was my machine’s fault too, I had a Janome Horizon and after the first week when I couldn’t get a consistent 1/4″ seam, I had a good look at it and it appeared to me that the needle wasn’t centred in the centre to start with, so I was never going to get a good 1/4″. When I took it back to the shop they were quite offhand about it, and intimated it wasn’t the machine’s fault but MINE. I went home and in disgust and played around with the needle setting and found that if I moved the needle over I could get a good 1/4″ seam. We pay a lot of money for these machines, they should give us a accurate 1/4″ seam as a matter of course, without the user needing to make a lot of adjustments every time. Now if I was designing a 1/4″ foot, it would be set so it was just under 1/4″ to allow for the fabric, thread etc. I reckon it was definitely a man that designed the 1/4″ foot. My blocks always came out smaller than they should – this is for years and I was always having to adjust the seams when sewing them together. Of course I thought it was my fault. Then I mentioned it in a quilting groups and the owner told me that the 1/4″ foot was only a ‘guide’!!! I would have done more accurate seams if I’d just followed the measurements on the bobbin cover – which is what I’ve done ever since. I can’t understand how a company/companies can sell these feet when they obviously are not an accurate guide. I have 2 Janomes and I love them, both came with 1/4″ feet and both feet make different width seams. Time to rebel I think. My Janome books do NOT say anything about position 41! I’m amazed at the number of us who have suffered this in silence! I went to a sewing group today and mentioned this and another lady said she had to move her needle 4 clicks to the right to get an accurate 1/4″! It’s outrageous! Hiya! Sally (aka RipStitcher) here! How nice of you to mention my blog! There are several other posts on my blog about this subject, It made me crazy that quilting machines are just marketed to be just that…. (Aaaargh!) …. But in reality, it takes significant brain damage to create the workaround s that give us he results we need. I’ll take a look at those other posts. I just posted about my further adventures with this on my Facebook page here.